WordPress incorporates a seamless system to let you create, manage, and edit content for your website. Being the number 1 CMS as of today, it ensures your site remains vibrant and dynamic, and your content captures the eyes of the audience you want. WordPress provides a host of other opportunities like SEO, a customized site, a hell lot of templates, scalability, and a full-scale content management platform that you just can't compromise with. With WordPress, you at least have an ownership of things, like, your own website! You can control how your site looks, feels and functions. And you can monetize your site and create content without restrictions. As a content development platform WordPress lets you ‘be' something. Because you can manage everything independently, without expert assistance, and its super easy to update your site. The process of creating, publishing, and sharing content on WordPress is ever so much easy because of the presence of a host of plugins that you can put in place. 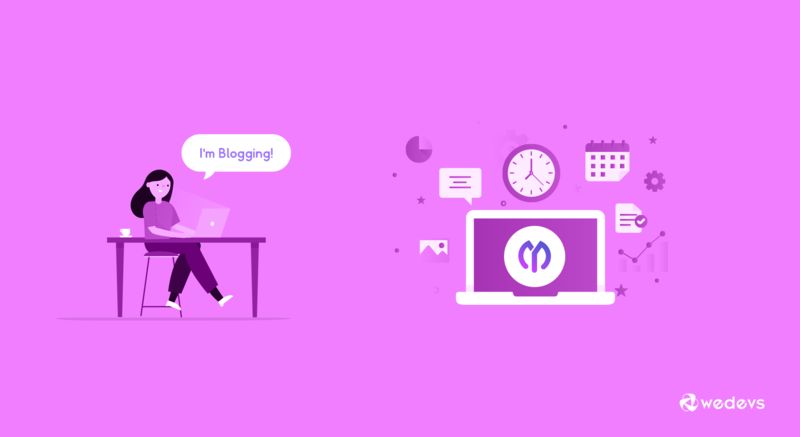 Here we talk about how WP Project Manager lets you make the most out of your WordPress blogging platform. WP Project Manager is a WordPress plugin that exempts users from doing things the usual way. It understands that teams today are digital that cross borders and span countless miles far. And since no one is confined physically, we now require new solutions that address these unique social circumstances. WP Project Manager helps in this regard to keep work going smoothly for any type of user through online and web task management. Beginner-friendly yet feature-rich for even advanced users to work efficiently. With WP Project Manager you can add any number of users and projects and tasks and even monitor the access you grant to each and every member. In this way you make updating content easy and you also bridge geographical and timezone gaps so everyone can contribute equally. You are getting an overview dashboard where you can create an unlimited number of projects department-wise, category-wise or any other way that suits you. Here you get to see a summary of all active and completed projects and you can search within projects for any task, task list, or milestones using the global search feature. You can also view your projects in a grid or list view or favourite a project that you want to keep at your instant view. To get started creating a schedule for your blogs click on a project you've created. 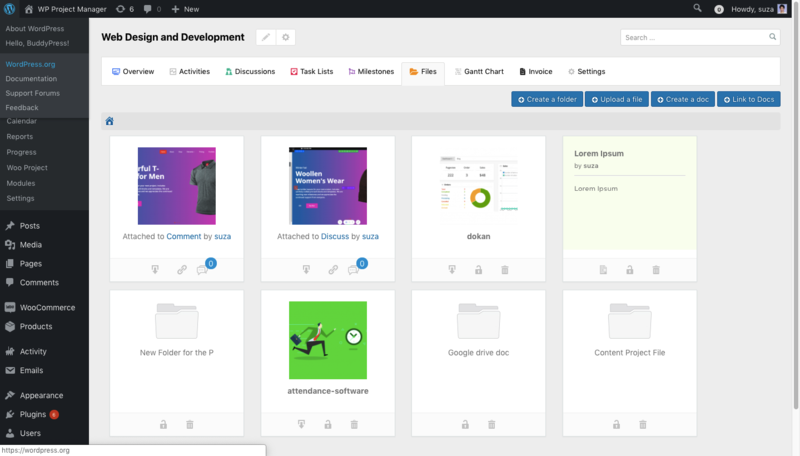 So let's see how you can manage a blog site in WordPress with WP Project Manager. Once you're ready with your ideas for blogs, you need to invest some time on creating a schedule. Successful blog sites publish content based on a set agenda and plan. This timetable is often a well-defined routine and roster that clearly states the topic of the blog, the assignee, due dates, and categories. Your publishing schedule will be the one that works for you and that's unique to your site. It will depend on your work plans, other members who work with you, your audience, and also what you're going to write about. Make it practical for yourself and for your team so you can keep up with it. And be prepared to adapt and modify when required. How often you need to publish posts are published – weekly, daily, on certain days of the week or at certain times of day. For example, the weDevs blog publishes new content on each weekday at the same time to reach audience most effectively. It's not just the regular posts. You'll also need to figure out a schedule for specific types posts that you need to run on certain days, such as, Black Friday, Cyber Monday, Christmas, Independence Day, and a lot more. This is specially important if you run your blog as a business. So you want to make sure you're not falling back with those holiday tutorials, tips and tricks for your audience, or your thoughts for these days. You've may dependence with other teams for videos, images, designs, and templates for your posts. In such a scenario, you'll also need to adjust your schedule with the schedule of other teams, as they may well have a different working plan. When you're ready with your ideas and how it you want to create your daily agenda, it's time to implement and create tasks! The task list is where you're likely to spend most of your time. Because here you get to create an unlimited number of task lists and tasks. Here can also view your deadlines, and what other members in your team are working on. Sometimes you may need to create tasks for blogs that come in parts or serially like step-by-step tutorials. To handle these a very convenient feature, known as the recurrent task feature is ready to help you automatically repeat a task weekly, monthly and annually. Whichever floats your boat! Set how many times you want the task to repeat, when you want it to expire and the duration of the task. With an interactive online calendar you can easily see how your blogs and deadlines fall against each other so that you can place them correctly when you plan your schedules. Digital calendars make life easier as you can stay more efficient without using pen and paper and noting everything down manually. The calendar will also show you the progress of every task in each project monthly, weekly, and daily. It gets much easier to stay on track and not get caught off guard with deadlines. A blog is empty without interactive content like images, gifs, and videos. But before you can implement them in your blog, you need to plan, structure, and design them beforehand. WP Project Manager has handy tools like the File Manager where you can simultaneously upload an unlimited number of documents. These include photos and files of any format. To manage your blogs better you can sort out your files in Folders. Create a separate folder for each blog. Here you can keep your images, videos, or anything else you need for your blog. Within folders you can create subfolders as well for further categorization. You can always rename your folders and name them on your blogs for easier management. 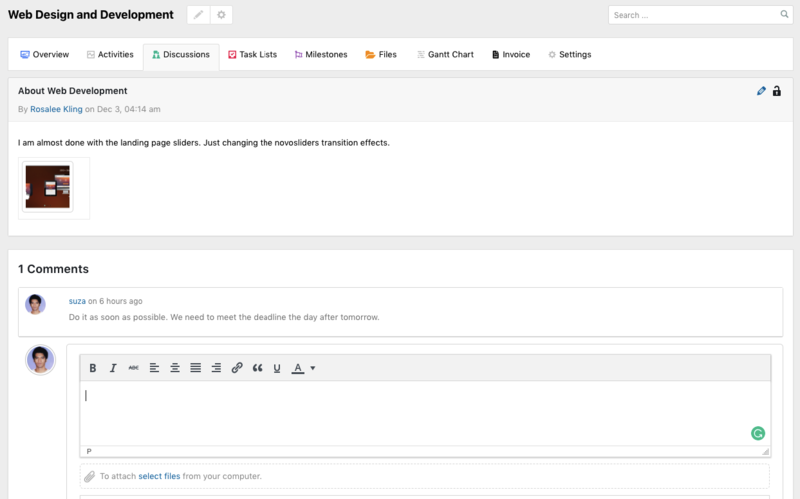 To create attachments in specific tasks you can always do it under comments in the single task window. 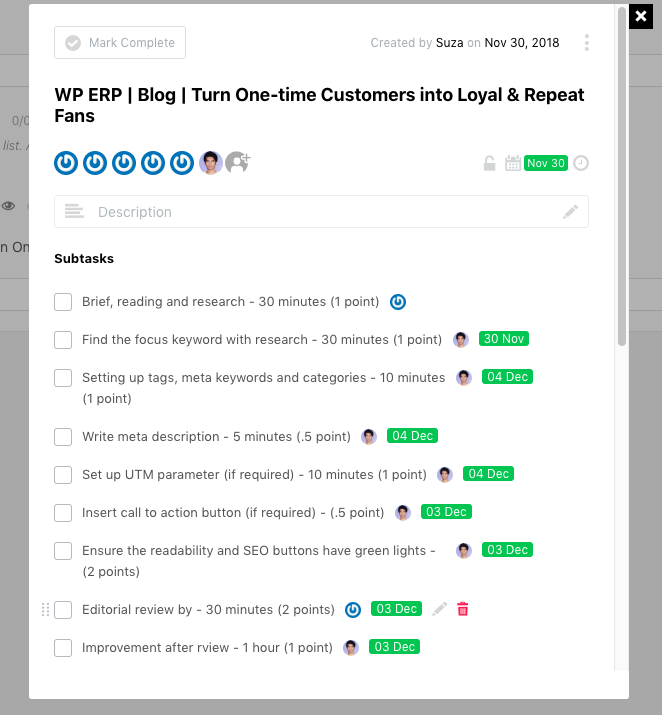 The single task page is your go-to-resource when you've to create a task and add details. 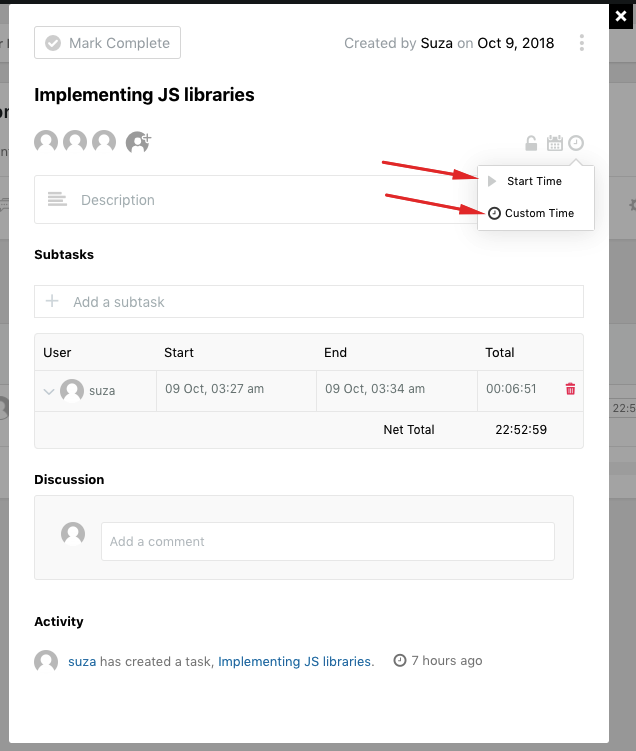 From this modal window you can do many things like set a start date and deadlines, add members, add a description, make comments, attach files, view activity, change status and view who created the task and when. But writing a blog is a process. Blogs are lengthy ordeals, no matter how much enjoy it. They include multiple steps and one needs to progress in stages. 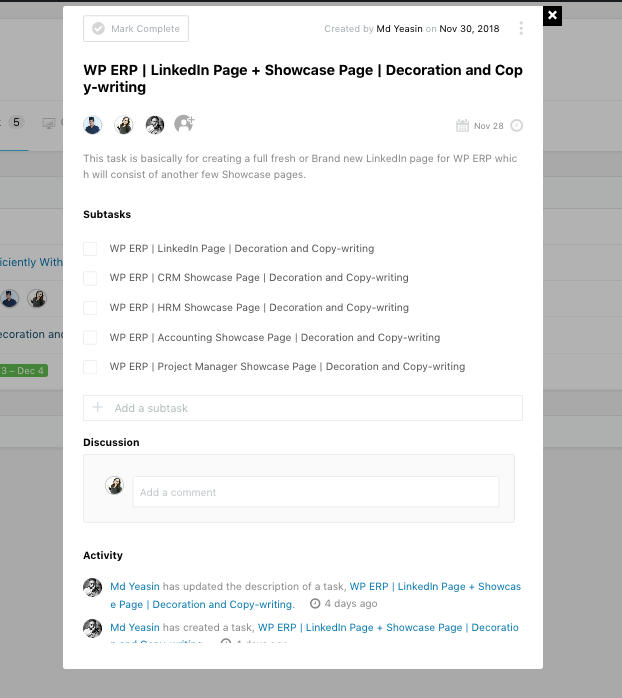 WP Project Manager has a handy tool to let you walk through your blogs in phases. This feature is known as Sub Tasks. With sub tasks you're able to divide your blogs into multiple branches that makes your task more achievable. From research and planning for an article to drafting, adding media, doing SEO, having it reviewed, creating UTM links, to having it published and shared on social channels – you can cover all phases with ease. The best thing about the Sub Task feature is that it makes a higher, and perhaps, more complicated goal, a more attainable one. In doing so, it makes a difficult job easier to complete. These smaller tasks add up to each other and let you progress serially to reach the end higher goal. The Best Web Task Manager & Time Tracker for your WordPress blog site! Create unlimited projects, task lists, task and sub-tasks with this open source project manager. Use time tracker to stay ahead. 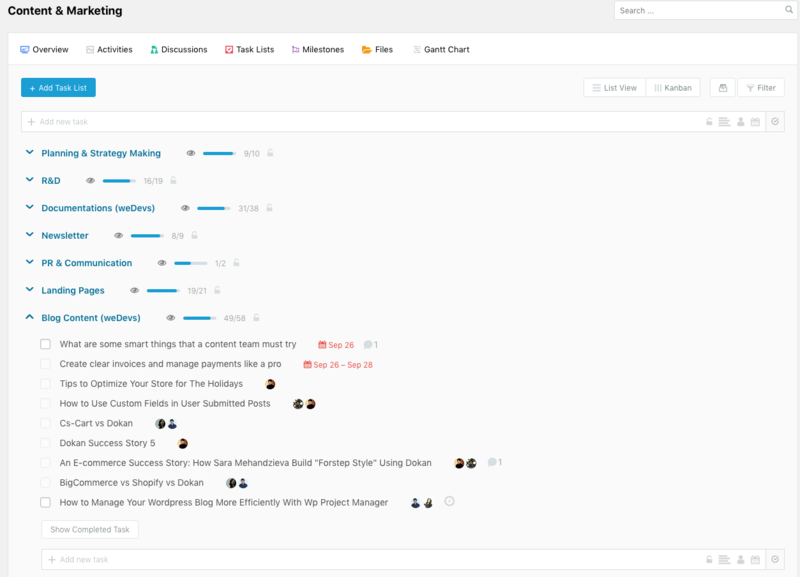 View progress via Gantt Chart, Kanban Board, Daily Digest, and Activity log. 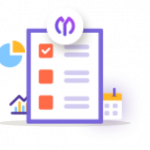 Redefine the way you manage your team, content, goals, and deadlines. For more in-depth tracking of your blogging process, you'll require something to keep track of your efficiency. And what's a better way to do this than keep track of your time. This is one of the best tools if you're also working along with different members. Log the times you've spent on a specific task and that's it! As a team leader you can demand from your co-workers to create logs every time they are working on a task. You can also use it for yourself when you're writing a blog. Using this feature honestly and consistently will help you get an insight on how much you and your co-workers are working efficiently. Of course difficult blogs that are based on research will take longer than simple tips and tricks write-ups. Simply use the start button to get started. Stop when you pause and the module will instantly log your time. Repeat this process each time you start working on your blog. 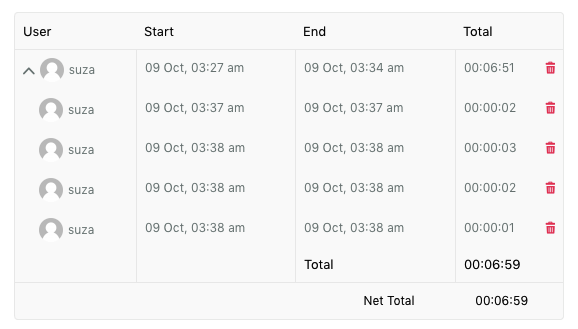 In this way you'll have a list of all the logs and a net total showing the sum up of time you spent on this task. The time tracking feature is also useful for reporting. It gives you a glimpse of how fast someone is working, so that you can reward a team member who consistently works ahead of deadlines. You can also use it to improve your own timing should you notice yourself slacking off. When you're working in a team, you obviously need to communicate with other co-workers more or less all the time. This is more the case when you're a team lead and you need to manage everybody's tasks. So what do you when you notice something isn't done on time or done incorrectly? And how do you keep things in perspective at all times? Through discussions! With WP Project Manager communication becomes seamless. Instead of using phone calls, SMS, and physical meetings, you can simply talk to each other online. In this digital age, discussions have become quite easy. Because you can have everything in one place instead of using several different solutions or apps. All your conversations will remain saved so you can come back and read them again. Best thing is you can add unlimited files, images, presentations and other documents in every thread and these remain in your database. So you're never lost in a sea of tasks and deadlines. Making communication seamless between everyone involved is a proven key to success that should not be taken lightly. Bonus: to notify a team member of an update or for small discussions, you can always use the comments section in single task page. You may be running a business blog or a blog for hobby. Either way you've to engage people through your site if you want to keep on bringing constant traffic and grow your blog. So if you're running a blogging site that's open for other users as well, you can use a simple plugin like WP User Frontend. 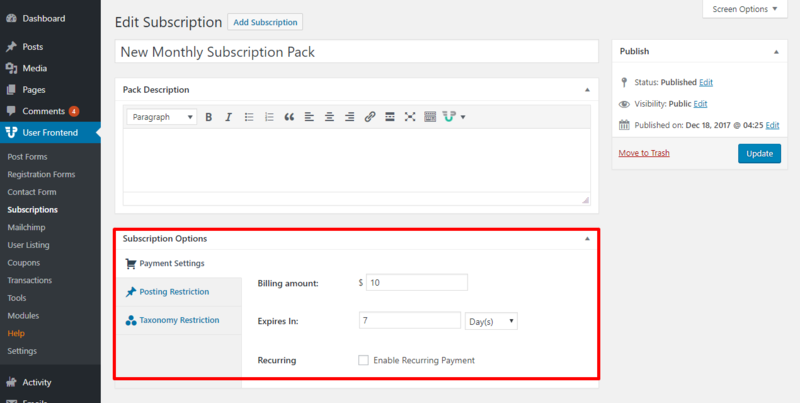 With WP User Frontend Pro you can easily set up recurring payment subscriptions, so that you can allow user-generated content at a multi-level memberships. 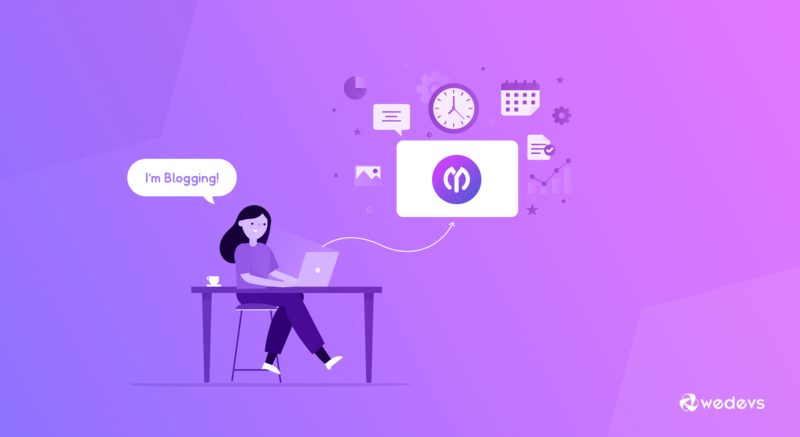 This plugin lets you create membership and subscription plans where you can put limits on how many posts your users can make for each package as well as decide the price for each yourself. You can offer users to write some content for free and more benefits to paid subscribers. This will allow your audience to engage with your site within the convenience of bundles that come with a lot of savings. With WP User Frontend, you can also customize and make the process of signing up and logging in to your site as easy as breeze. This will also help subscribers to make comments whenever they want. What's more! Should you want to allow users to post from the frontend of your WordPress site without giving them access to your backend, this plugin would be your best friend. Create discount coupons for long-term users or for the holidays. Developing a dedicated blog site is definitely hard work. And to sustain it is even harder. You need to constantly generate new ideas for content, publish and share interactive and knowledgeable posts with the right audience through the right medium, and ensure that you're engaging people enough through comments, subscriptions, or purchases. A successful blog site helps you make income out of it or if you're doing it out of leisure, you'll have the satisfaction to interact with an audience who may share similar thoughts and interests as you and grow your own community of followers. And when you're consistent at creating good content and engaging your audience, your readers will share and recommend your content to friends, acquaintances, and colleagues more, thus making you go viral. What’s your experience of writing blogs in WordPress? Do you have a site where you create & share engaging content everyday? Share your valuable anecdotes and ideas about creating & managing a blogging site in WordPress.